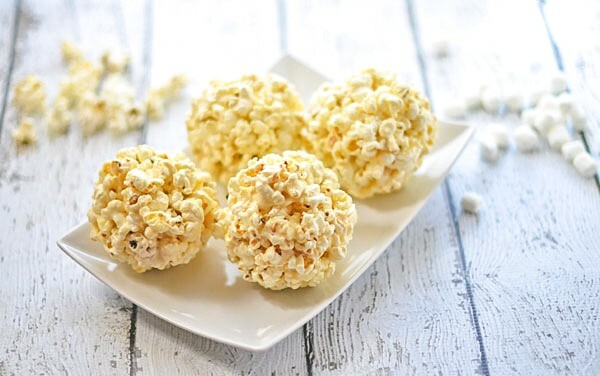 Love microwave popcorn but want something a little more all-natural? Check out our guide on how to make homemade microwave popcorn. It’s so easy! Did you know that January 19th is National Popcorn Day? I didn’t, but I love popcorn so much I could certainly celebrate by eating popcorn almost daily. I love the ease of microwave popcorn. But, over the recent years, I’ve felt like it tastes faker as we love the super buttery flavors. The questionable ingredients kind of leave one wondering is microwave popcorn bad for you, too. So, I set out to start making my own homemade microwave popcorn. To me, it’s stupid easy to make and really is the best microwave popcorn ever. 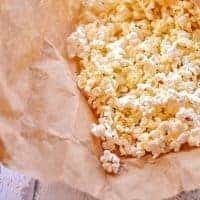 After making homemade microwave popcorn for years here are some of the tips I’ve discovered. 1. 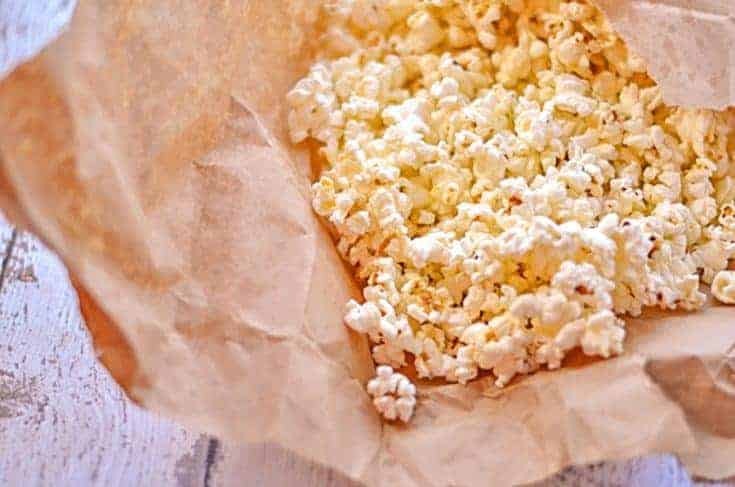 If using a paper bag to make your homemade popcorn, be sure isn’t made of recycled materials unless it says it can specifically be used in the microwave. Otherwise, it could contain small amounts of metal, which is bad for microwave cooking as it can lead to fires and/or damage to your microwave. 2. Don’t add too many popcorn kernels. While a lot can fit in your standard paper bag, you risk making the mess of a popcorn volcano all over your microwave. Plus, I find you risk burning the popcorn on the top before most of the kernels have popped. 3. Keep an ear on your popcorn. All microwaves are different. So, even if you’re using the popcorn button stay close to your microwave and stop it when you don’t hear a kernel pop for 3 – 5 seconds. Unless you like burnt popcorn. 4. Keep an eye on your popcorn, too. While I’ve never had this happen, you want to be alert and keep an eye on the microwave whenever you’re cooking using a paper product as it does have the potential to catch on fire. If you do have a microwave fire, immediately turn off the microwave (so the fan stops feeding the fire oxygen) and wait until the fire dies out completely before opening the microwave. 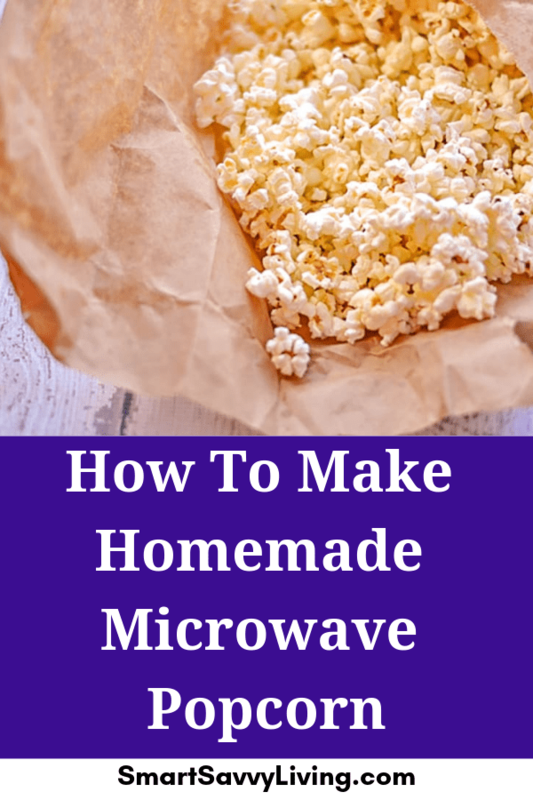 I love this method because it’s simple and you don’t need a special microwave popcorn popper. 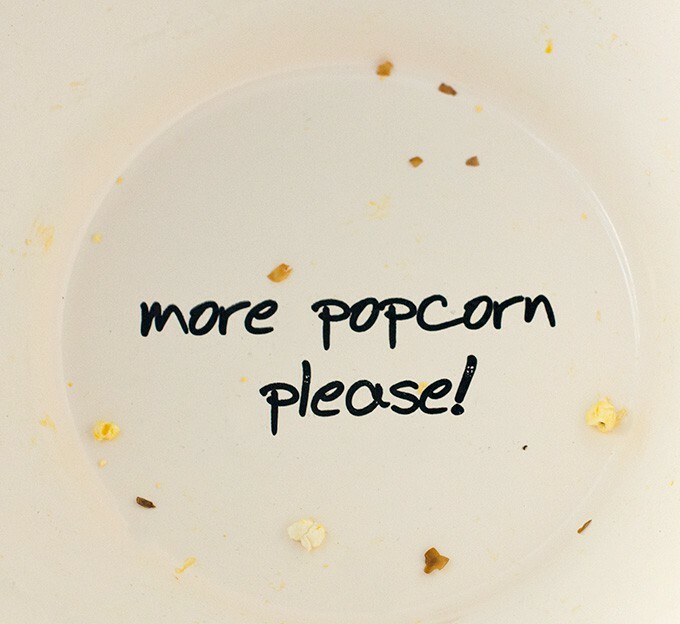 Place unpopped popcorn kernels in a microwave-safe bag. See the homemade microwave popcorn recipe below for measurements I use. Add oil and salt. Shake bag. Fold over the top of the bag and microwave until you don’t hear any corn popping for about 3 seconds. If you like this big popcorn bowl you can find it at World Market and there are also matching individual bowls. I’ve never actually made microwave popcorn in a bowl but I’ve seen several styles of bowls on the market lately. I’ll definitely be trying one out once we use up all the paper bags. Looking for a way to use up some of that homemade popcorn? 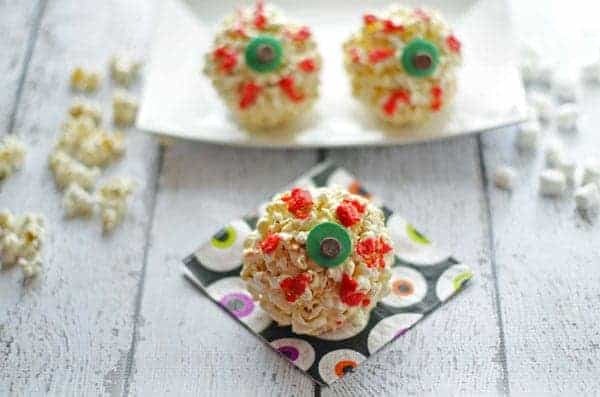 My Eyeball Popcorn Balls Recipe is perfect for Halloween or a scary movie night! Here’s how I make my microwave popcorn. I love it topped with butter, salt, and sometimes a pinch of pepper. I also recently tried this popcorn seasoning that also doubles as an oil you can use to pop the corn. It’s delicious! If you are making a bunch of popcorn at once to have on a later day I’d wait to top it until you go to eat it or use a powdered seasoning. Otherwise, it may just get soggy and icky as it sits. Place popcorn into a microwave-safe paper bag. Add oil and salt, if desired. It's not needed to cook the popcorn but does help to season it. Fold the top of the bag down about half an inch. Then fold again as tightly as possible. Place into the microwave on high and pop for about 2.5 minutes or until you don't hear a pop for around 3 seconds. Pour into a bowl or eat it straight from the bag with desired toppings. Be sure to use a bag that is microwave-safe to reduce fire risk. Recycled bags may contain fragments of metal which can easily lead to fire in a microwave. I often use olive oil, coconut oil, or popcorn oil. You can even try bacon fat for an added flavor boost.